In the last dreary days of an Erie winter, residents frustrated with their seemingly endless state of semi-hibernation feel their senses start to stir. Asthe ache for spring grows more poignant, we seek sensual delights: to feel the sun on our skin again; to taste something other than the usual, tired fare; to hear music that urges us forward into the vernal season we've all but forgotten. Spring is almost here, and I don't know about you, but my senses are starving. Come to think of it, a martini adds the perfect finishing touch to this imaginary, idyllic scene. Hmmm . . . what to order?Where to go? Sunny warmth. International cuisine. Playful jazz. Dry martini. Mere fantasy. Or is it? Aside from Mother Nature's role, one need not seek a metropolis beyond the city limits to fill this tall order. Among the restaurants and bars sustaining Erie's night life, one restaurant can both stimulate and satisfy all your senses: Matthew's Trattoria. A trattoria is an Italian-style restaurant less formal that a ristorante, meaning the dress is casual and the fare is relatively inexpensive. In the tradition of trattorias, you can also call in to place you order and pick it up. A romantic dinner at home suddenly got a whole lot easier. The restaurant, a project Matthew Sarbak and his wife, Cindy, have shaped and expanded over the past sixteen years, includes a martini bar and a performance area for many of jazz's finest. The couple moved the restaurant to its current location in Lovell Place over twelve years ago. Located at 153 E. 13TH St., the setting's courtyard also accommodates those seeking the alfresco experience, providing the tastes and sounds only The Tratt can offer. The restaurant's mantra is simple: "eat, sip, much. . . .chill." The restaurant's mission, however, implies a larger objective: "Our business is here to fashion and create the finest restaurant in Erie while specializing in upscale contemporary cuisine using only the freshest and highest quality ingredients in preparing tapas to order." Matthew's Trattoria is the only restaurant in Erie offering a tapas menu. Tapas, a style of dining involving various plates in small portions, originated in Spain. Whether with one person or a group, ordering tapas often means guests order several small plates and share them amongst each other. Chef Matthew notes that tapas allows for "a widening of the palate." Beyond the gustatory benefits, the tapas experience invites social benefits as well. Rather than detaching ourselves from human contact with a slew of digital devices and eating where we can, when we can, tapas require that we slow down and savor, enjoying each dish as it comes. We eat less and socialize more. All the meats, seafood, herbs, and vegetables are ready to go at a moment's notice. I'm especially impressed by the looks of the lump crab. Having lived in Baltimore for nine years, I can recognize that this is fresh, quality lump crab meat. Matthew's offers the crab cakes as a tapas for the mildly curious, or those who fear commitment. If you like what you taste or you're ready to commit, try the full dinner: "three house crabcakes with just enough breading to hold them together, splashed lightly with ponzu sauce and garnished with remoulade sauce and corn relish." The chefs create dinners, tapas, and desserts as they are ordered, and only from the freshest ingredients close at hand. No heat lamps exist in this restaurant; the staff seems constantly in motion. According to The New Professional Chef, a textbook for cooks-to-be, mise en place "means far more than simply assembling all the ingredients, pots and pans, plates, and serving pieces needed for a particular period. Mise en place is also a state of mind. Someone who has truly grasped the concept is able to keep many tasks in mind simultaneously, weighing and assigning each its proper value and priority. This assures that the chef has anticipated and prepared for every situation that could logically occur during a service period." Whether you want a pizza and pitcher of beer or a crab cake dinner paired with a Chardonnay, Matthew's offers daily specials on both food and drinks. The bar is fully stocked and the bartender knows her way around a cocktail. Whether stopping by to socialize over a few drinks or aiming for the full dining experience, you haven't fully appreciated Matthew's unless you've soaked in the sounds of the jazz musicians who frequent The Tratt. Matthew's starting hosting "Jazz in the Courtyard" last May, featuring local musicians Joe Dorris and Frank Singer. When Mother Nature shooed everyone inside, they decided the music couldn't stop. You can enjoy live jazz from 7 to 10 p.m. every Friday night, usually free of charge. On Friday, Feb. 18, you can hear Erie's own Mary Alice Brown at the Tratt. For no cover charge, you can be inspired by Erie's Queen of Jazz. On Saturday, Feb. 19, a six dollar cover charge will get you into the jazz realm of Ernie Krivda., a highly acclaimed tenor saxophonist whose musical career spans nearly five decades. Linked to the likes of Miles Davis, Cannonball Adderly, Herbie Hancock, Chick Corea, and Stan Getz, Krivda will light up The Tratt this Friday. I recommend reservations. Both Dorris and Singer are actively involved with JazzErie, a community of musicians and music-lovers who have brought jazz to our area for fifteen years. Tony Grey, an international multi-instrumental talent whose compositions blend world fusion with jazz, has also played with some of the biggest names in the jazz world. You can catch him this month at The Tratt. Dorris explains that the typical song list at The Tratt consists of jazz standards, a term jazzers will explain refers to several hundred songs that hold such a timeless appeal that they remain a part of the musical repertoire. This comfortable framework lends itself to various interpretations, where musicians can, as Dorris describes it, "stretch out." You can expect a range of moods from standards. One jazz standard may have a fun and frantic feel with a chord change on every beat while the next melodic composition hints at romantic possibility. You'll also hear a few originals, from time to time. 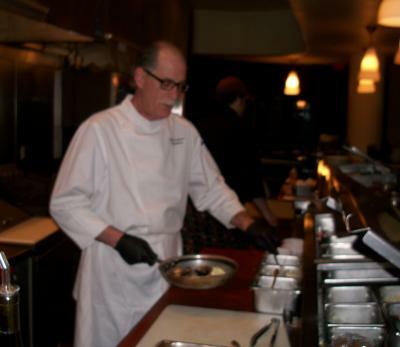 Chef Matthew's love of jazz came naturally as he has been around the music all of his life. He believes that jazz is "America's music. . . something everybody can relate to." When it comes to feeding the body and feeding the soul, Matthew's Trattoria satisfies both.